No. 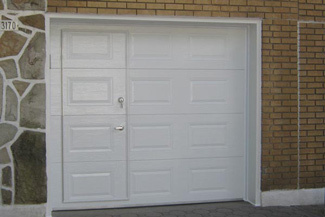 However there are certain Garaga dealers who provide this service of transforming their garage doors by adding a pedestrian door. A pedestrian door is 36 inches wide by 78 inches high. It is used primarily when there is no other access than the main garage door. For your safety, and if you use an electric garage door opener, it is important to install a blocking mechanism to prevent the door opener from working if the pedestrian door isn’t completely closed. Contact us today to set up an appointment so we can help you prepare your project. 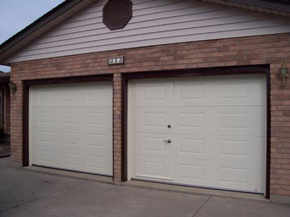 We have worked with garage doors for many years now and our goal is to make purchasing your next garage door a pleasant one. We will respect your needs, your tastes and above all, your budget. We also carry LiftMaster electric garage door openers and their accessories to simplify the day-to-day use of your garage door.